Noodles consist basically of flour and water. A stiff dough is prepared from flour and water. Knead the dough thoroughly, cover with plastic, and allow it to rest for 20 minutes. Flatten the dough with a rolling pin and make a sheet 1mm thick (the thickness of a U.S. penny). Dust with flour to prevent sticking, as necessary. Roll the sheet into a log, and cut slices of the width desired for the noodles. 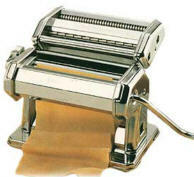 A pasta machine, such as the one illustrated here, can be used to roll and cut the dough evenly. 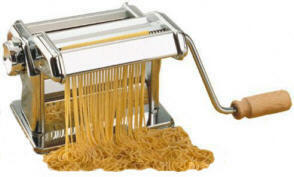 Egg noodles are made by using two eggs plus enough water to make 1/2 cup instead of the plain water. To cook the noodles, drop them into boiling water and boil for approximately 10 minutes. Drain the noodles and serve them topped with your favorite spaghetti sauce, beef Stroganoff, or chicken cacciatore. You can also make noodle soup by adding the boiled noodles to a well-seasoned chicken soup.